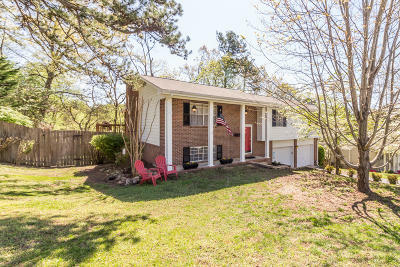 Exceptional value describes this updated, well maintained Home. New kitchen with new, stainless appliance including refrigerator, stove, dishwasher, microwave & beautiful white cabinets. New granite counter tops. Large bay window brings in an abundance of light. Dining room leads to a generous size screened porch and grilling deck overlooking private, fenced yard. Living room overlooks large front yard with beautiful mature trees. Brand new carpet throughout. Master bedroom is situated on main floor with private bath plus an additional 2 bedrooms & bath. Relax next to your fireplace with gas logs downstairs. This all purpose room is exceptionally large. Another bedroom/office & 1/2 bath is located downstairs. Minutes to shopping, medical, Chester Frost Park & walking trails and Greenway.